Chris is a young man in his 20’s who came to the BridgingApps program because of his interest in technology. He and his mother wanted to understand how he could use his mobile device to help him be more productive and organized as he began to search for a job. He owned a smartphone, but his phone was quite old and he did not use it for more than the basics, mostly entertainment like games and listening to music. Because one of his long term goals includes getting a job, he needed assistance in understanding some effective ways he could use it to help him achieve his goal and be more independent. Through a generous grant from the Hogg Foundation for Mental Health, BridgingApps provided Chris with a new smartphone and one on one trainings with Digital Learning Specialist, Tara Rocha. 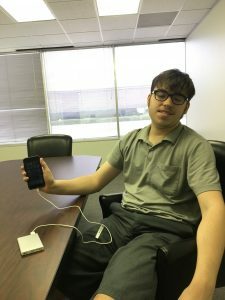 Part of the barrier to using his smartphone effectively was that as a young man with autism, he experienced anxiety about draining the battery, so he preferred to have it plugged into the wall. Having it always plugged into the wall to charge limited his mobility and served as a distraction from more important daily tasks. During one of the training sessions, Tara introduced the concept of a using portable rechargeable battery pack. Because it is small and rechargeable, Chris learned to plug his smartphone into this device, immediately easing his anxiety about draining the battery. This small change has allowed him to be more mobile and focus his attention on other things. During just one session, Chris was trained on how to access and back up his data using iCloud, use Find My Family, Friends Phone, set up Family Sharing, how to delete unused apps, how to load an iTunes card, use Google Maps, set favorite contacts and maximize his calendar in order to manage appointments more independently. Chris learned how to create calendar appointments, add items to task lists, back up his data, use contacts, and much more. Following each session, he has practiced the tasks at home with an at-home assignment. Chris has been using Google Maps to explore how he can navigate to and from a location on his own! When Tara demonstrated several app options for filling out forms using his smartphone, Chris became so excited that he could complete this task digitally! He found it difficult and laborious to fill out forms required for job searches and other forms required as he moves into adulthood. By using the app Adobe Fill & Sign, he can more independently fill out forms, submit, share and print them. Writing has been a challenge for him, but he is much more eager to use his phone for this task. He has even learned to use voice commands and Siri to create new calendar appointments, easing the burden of having to write or manually type appointments and commitments. We wish Chris the best of luck as he continues his job search, and we will continue to keep in touch as he makes progress towards his goals.